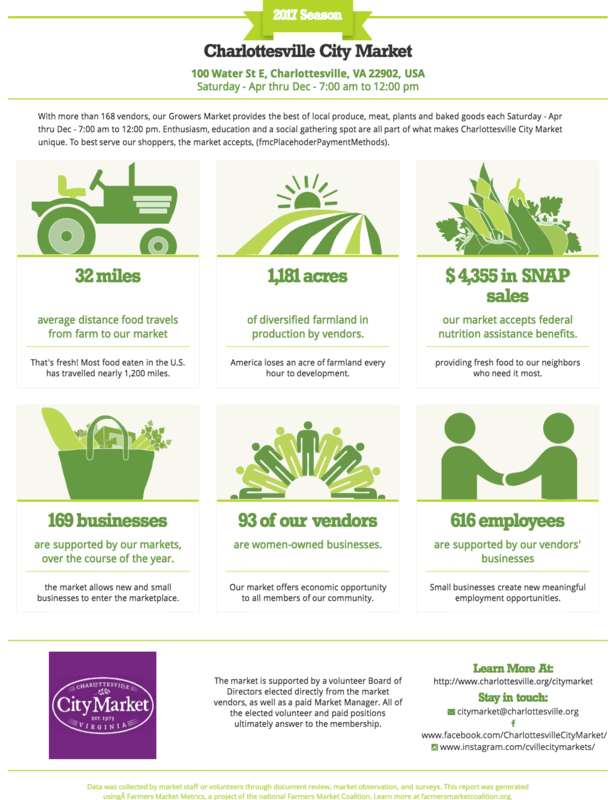 Farmers Market Metrics is helping markets across the U.S. to showcase their impacts and tell their story. Browse this page to get ideas for your market, and be sure to submit your own Metrics in Action! Visitor attendance was shared with and favorably received by the Director of Parks & Recreation, Economic Development, the City Manager’s office, and market vendors at their 2018 Annual Meeting. 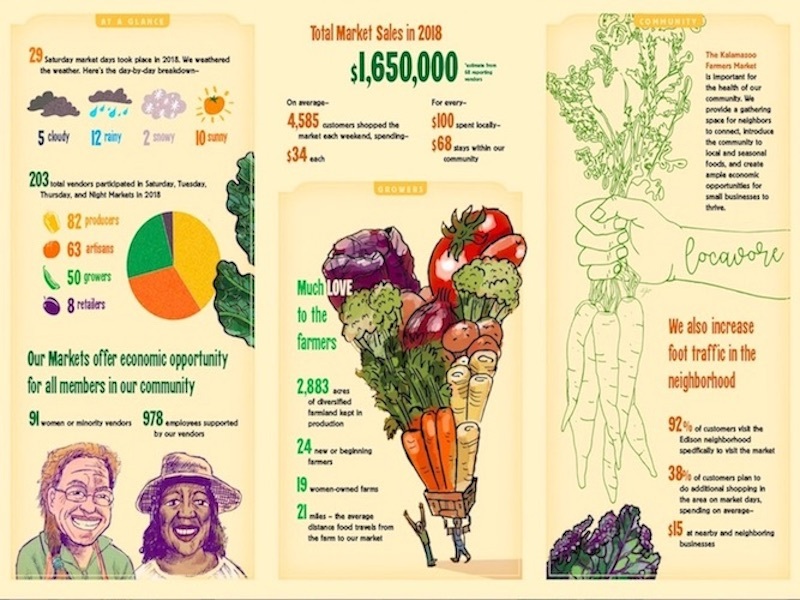 Michigan -Markets in Michigan have been using the Metrics resources and platform through the Michigan Farmers Market Association (MIFMA) since 2017. This partnership has offered the Metrics team invaluable feedback from MIFMA staff and markets. VIRGINIA – Tracy Herner runs a #TuesdayTweets campaign at her Williamsburg Farmers Market in historic Williamsburg, Virginia. Each week she shares a metric with a thought-provoking question to make visitors really think about what the data is saying. 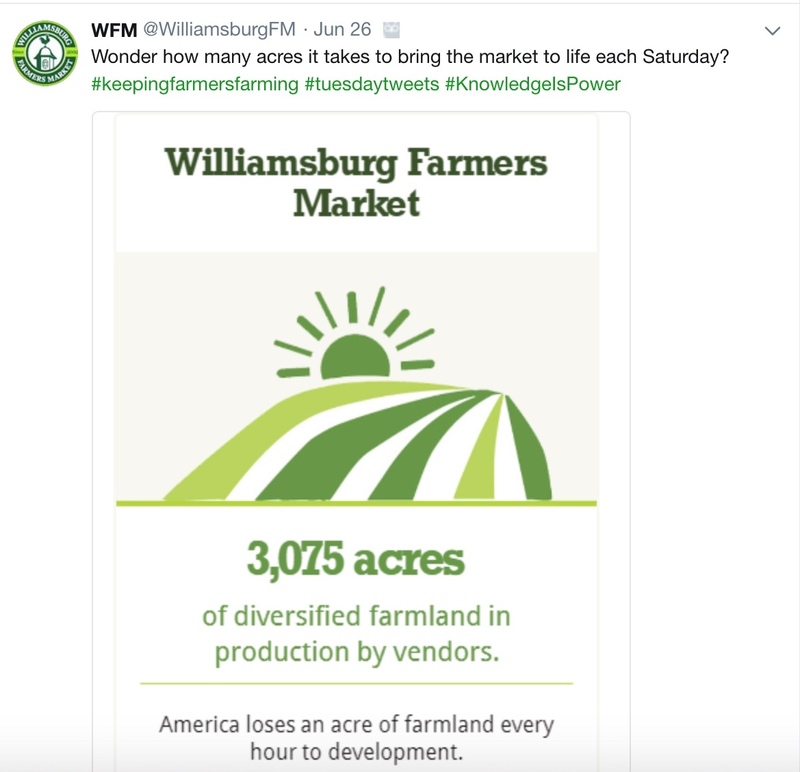 OHIO – Erin Molnar of Countryside Farmers Market continues the tradition started when the markets first opened to collect and share data with her vendors. She sends all vendors a weekly Market Statistics email, which includes change in sales, attendance, and weather information compared to the previous year. This kind of data helps vendors to gauge the market day and not just rely on anecdotal experience. This also helps vendors to understand how they’re doing in relation to other vendors at the market, and make adjustments as necessary. VIRGINIA – The Hampton Blvd. 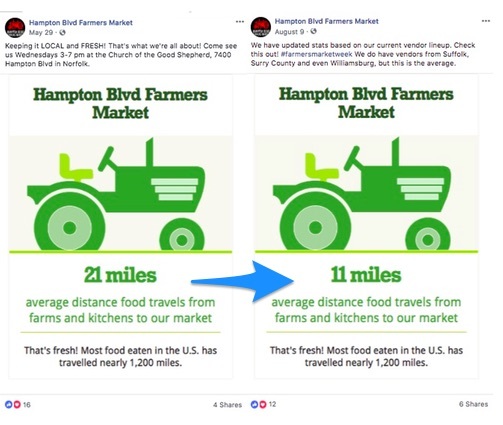 Farmers Market is leading the way in using the one widget model of data use. At the outset of their inaugural market season in 2018, vendor profiles offered a very impressive average 21-mile distance from production site to market. By the height of the summer season with new vendors coming, the market was able to show an even more impressive 11-mile average distance from production site to market! Not only does that stick in shoppers heads (to encourage those shoppers to see their vendors as neighbor/entrepreneurs), it lets prospective vendors know the market prioritizes nearby production and helps municipal and regional leaders understand why farmland preservation matters. MISSISSIPPI – Sometimes a metric can show you the best way to use its data. 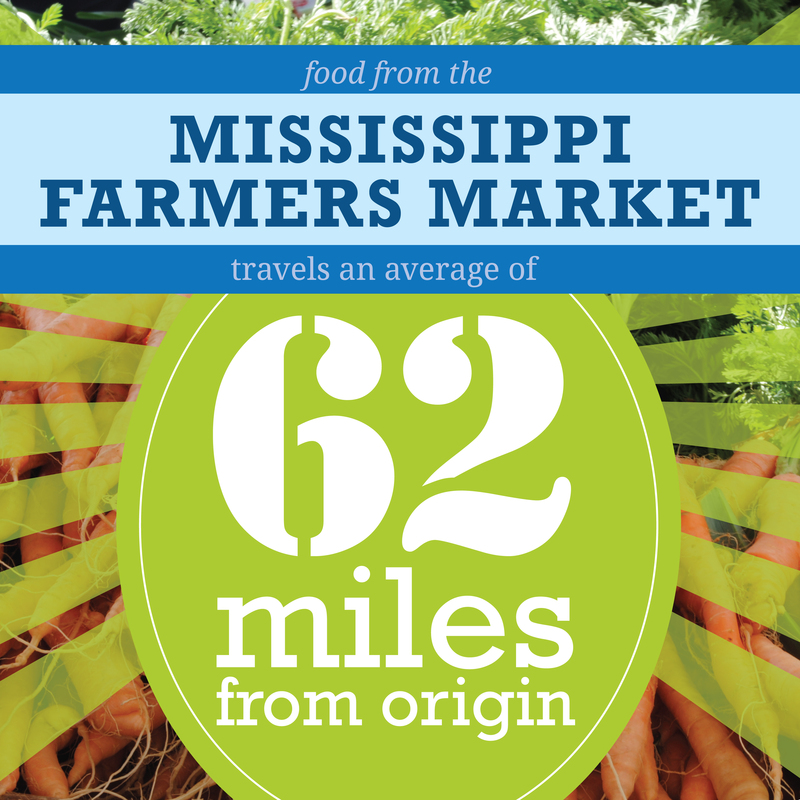 The Mississippi Farmers Market was so pleased with how this metric’s data told a story about their market and how easy it was to understand that they printed it exactly like this for the Department of Agriculture’s newsletter and made t-shirts with it for the market staff to wear. Louisiana – Not all data has to be shared electronically! 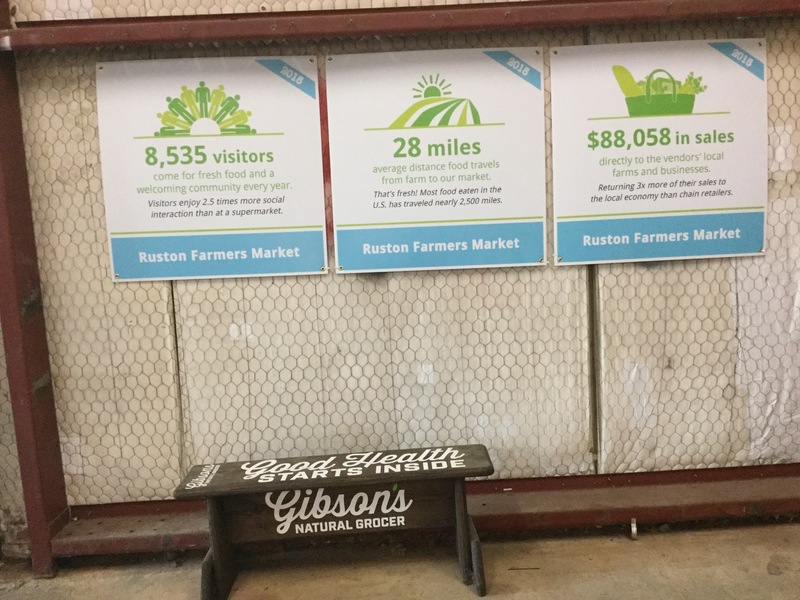 The Ruston market liked some of the individual data they gathered so much, they printed them as permanent sings in their market space.